On the edge of the picturesque village of Tisbury in Wiltshire is a new art centre. Messum’s Wiltshire – opened last autumn by Johnathan Messum, scion of the eponymous London dealership – follows in the footsteps of Madeleine Bessborough’s New Art Centre at Roche Court, near Salisbury, and Hauser & Wirth’s genial Somerset outpost down the road at Bruton. The gallery is based in a spectacular 14th-century tithe barn, which is said to be the largest in England, and was built for the Abbess of Shaftesbury. Its owners, the Fonthill Estate, have recently restored the building immaculately. Messum persuaded them that rather than host weddings, they should enable the creation of an ambitious arts venue where selling exhibitions could be mounted alongside music, dance and other events. The idea is to appeal to affluent weekenders and city escapists, while also bringing high-quality exhibitions, concerts, workshops and other educational opportunities to the local community. The latest show at the gallery, ‘Material: Earth’, is the first of three to explore work by artists who make things by hand, from natural materials. 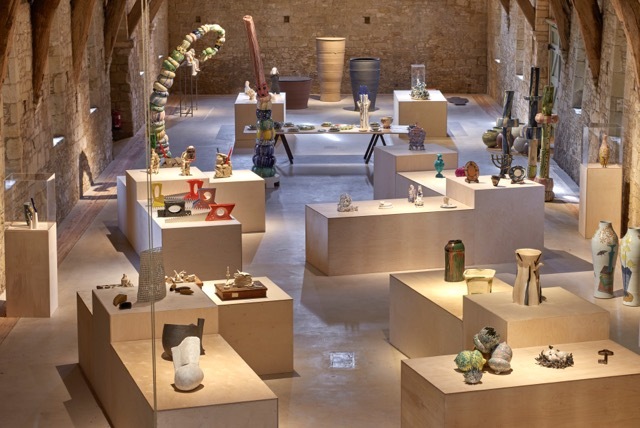 Clay is its theme, picking up on a surge of interest in the medium among artists, collectors and the general public, fostered by high-profile figures such as Grayson Perry and Edmund de Waal. The beautiful, hand-made building, with its giant carved roof beams, stone walls and thatched roof, provides an inspiring context in which to consider these earthy yet ethereal works. This is no country jumble of brown pots. Curators Catherine Milner and Anna Pryer, guided by consultant dealer Joanna Bird, have made an impressive selection of significant works in clay from midway through the 20th century until today. Among them are the ground-breaking ceramics of Gillian Lowndes and Ewen Henderson, both artists who understood the humanity and expressive potential of the medium. Their rough and sculptural pieces from the 1990s retain only the most tenuous of links with functional pots. They are placed alongside an iconic thistle vase – its form inspired by Cycladic sculpture – by Hans Coper, whose work inpired radical developments within British Studio Ceramics in the 1960s, and some serene porcelain cylinders by Edmund de Waal, which look back to another ancient ceramic tradition in China. 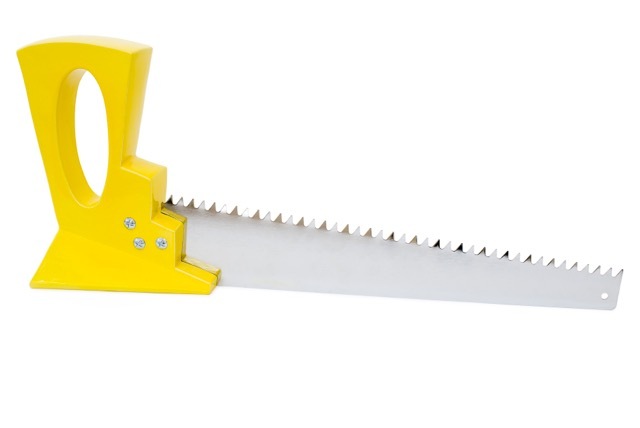 Tall Yellow Saw (2014), Richard Slee. All the leading figures of British ceramics are represented, from Elizabeth Fritsch’s refined analytical pots, which play with two- and three-dimensional perspective, to Alison Britton’s exuberant formal experiments, enlivened by their painterly surfaces. Philip Eglin has reinvented the ceramic figurine as an object capable of pathos and brash contemporary political resonance, while Richard Slee’s Pop objects – in this case, a series of non-functional chainsaws with enormous, eccentrically formed ceramic handles – poke fun at our preconceptions about clay’s place in art and society. There are works from the very beginning of Grayson’s Perry’s career, plates and pots with scabrous inscriptions, embracing every style from ancient Greek pottery to the 17th-century English slip-ware of Thomas Toft. The range of mood and method is huge. Annie Turner’s gridded structures, inspired by fishing nets and creels, reflect a modernist’s love of geometry and abstraction while also evoking the random fluid movements of the sea. Christie Brown’s The Uncanny Playroom (2010), by contrast, presents a shelf of spooky doll-puppets, waiting, as if to be brought to life. 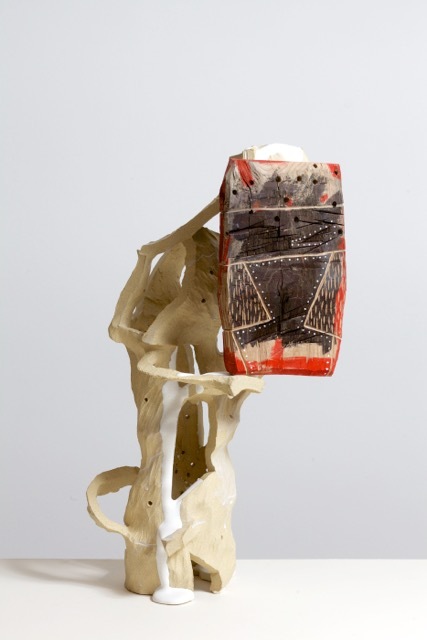 Some of the featured artists combine materials, such as Nao Matsunaga, who uses slices of clay and wood to build striking contemporary ritual objects. Others, like Geoffrey Mann, represented here by a set of surreal 3D-printed domestic objects, make use of new technology. In scale too, the exhibition accommodates everything from Sandy Brown’s joyful, teetering tall ceramic towers, like giant cartoon caterpillars, to Sam Bakewell’s A Small Act (2009). This exquisite, highly personal work, which is not for sale, depicts a lifesize honeybee lying on its back inside a wreath of tiny leaves and flowers, all meticulously rendered in a deathly white parian clay, and laid on grey felt. A strange memorial, it draws equally on histories of art and design and on the immediate emotional resonances of materials. As Messum says to me, these are not works that require fat catalogues to explain them. Together, they represent a significant strand of contemporary British art, rising to the surface. ‘Material: Earth’ is at Messum’s Wiltshire until 1 May 2017. Large, long windows and a flat roof for sunbathing: is it any wonder that Britain’s early experiments with modernist architecture were by the sea?